Oral solution: Vials (single dose container) of 15 ml: Box of 10. 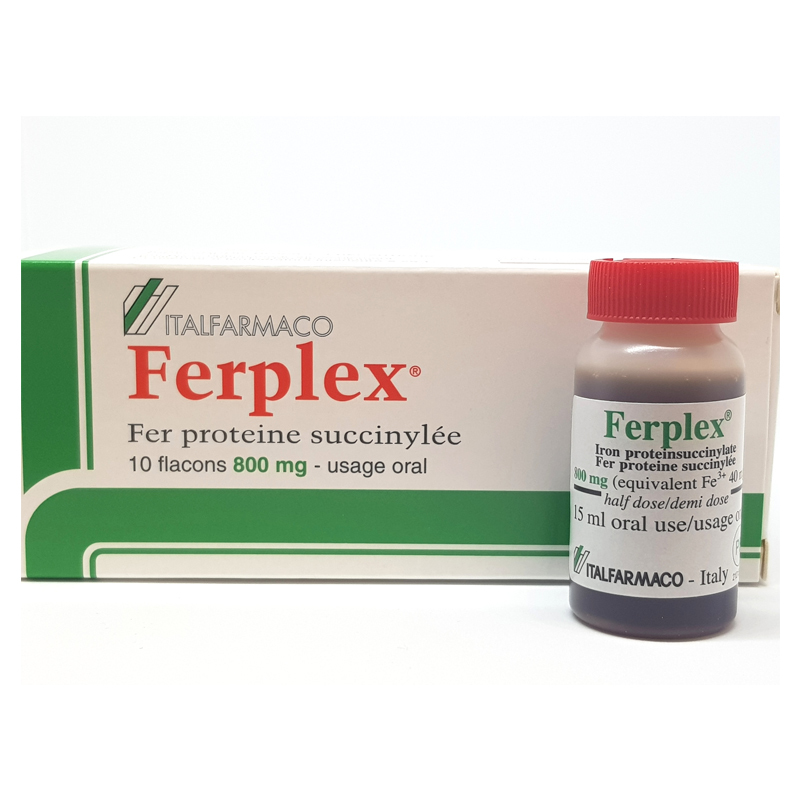 Each vial contains: Ferric proteinsuccinylate: 800 mg (equivalent to 40 mg of Fe3+). Excipients: Sorbitol, propylene glycol, methyl-phydroxybenzoate sodium salt, propyl-p-hydroxybenzoate sodium salt, Morella flavour, sodium saccharin, purified water. Antianemic drug containing trivalent iron, for the treatment of iron deficiency anemia. Treatment of iron deficiency and iron deficiency anemia: latent or overt iron deficiency anemia in children and adults, secondary to chronic blood loss, pregnancy; breast-feeding. Hypersensitivity to the active substance or to any of the excipients. Haemosiderosis, haemochromatosis. Aplastic and haemolytic anemias, anemias due to disturbancies of iron utilization (sideroachrestic anemias). Chronic pancreatitis and liver cirrhosis secondary to haemochromatosis. No particular warnings are required about risks of tolerance or addiction. The treatment should not exceed 6 months, unless in case of persisting bleeding, menorrhagia or pregnancy. Any disease possibly underlying iron deficiency or iron deficiency anemia must be ascertained and properly treated. As the product contains milk proteins, it must be used with caution in patients suffering from milk-protein intolerance, who may have allergic reactions. Ferplex vials contain sorbitol, therefore patients with rare hereditary fructose intolerance must not take this medicine. Ferplex vials contain parabens (methyl-p-hydroxybenzoate sodium salt, propyl-p-hydroxybenzoate sodium salt) that may cause delayed allergic reactions. Iron may impair absorption or bioavailability of: tetracyclines, biphosphonates, quinolone antifective agents, penicillamine, thyroxine, levodopa, carbidopa, alpha-methyldopa. Ferplex should be given with 2 hrs interval from administration of any of these drugs. Iron absorption may be increased by the concomitant administration of over 200 mg of ascorbic acid or reduced by the concomitant use of antacids. Chloramphenicol may delay response to iron treatment. No pharmacological interaction was reported during concomitant treatment with H2-antagonists. Iron complexing agents (such as phosphates, phytates and oxalates) contained in vegetables and in milk, coffee and tea inhibit the absorption of iron. Ferplex should be given with 2 hrs interval from intake of such foods and beverages. Very rarely gastrointestinal disorders such as diarrhoea, stipsis, nausea, epigastric pain may occur; these adverse reactions can be abated by dose reduction or treatment withdrawal. Iron products may turn the colour of stools into black or dark grey. Adults: 1 to 2 vials a day (equivalent to 40-80 mg of Fe3+), in 2 administrations, preferably before food. Children: Take 1.5 ml/kg/die from a vial (equivalent to 4 mg/kg/die of Fe3+), in 2 administrations, preferably before food. Drink the solution out of the vial or dilute it in natural water. Duration of treatment: the treatment must be carried on until total recovery of normal iron stores (usually for 2-3 months). Maximum daily dose: clinical trials on the product effectiveness and tolerability were made administering the product at the above specified dosage levels (adults: 1600 mg/day - Children: 1.5 of ml/kg/day of iron proteinsuccinylate); no data about clinical efficacy and tolerability of higher dosages of the product are available. Following ingestion of high doses of ferrous salts, epigastric pain, nausea, vomiting, diarrhoea, and haematemesis, often associated with drowsiness, paleness, cyanosis, shock up to coma may occur. Treatment is immediate administration of an emetic, if necessary followed by gastric lavage, associated with suitable supportive measures. If necessary, iron-chelating agent, such as desferrioxamine, may be administered.